Back in the sixties when I was still a young boy, whenever I went with my family to Nasugbu, where my mother was from, we could not but take notice of this mysteriously slanted row of houses along a stretch of road past the Municipality of Cuenca into the next town of Alitagtag. Elsewhere, the fronts of houses built roadside, as seemed natural, faced the road. But along this stretch of road, the row of houses curiously slanted to one side so that their fronts faced away from the road. No disrespect to the inhabitants of Cuenca and Alitagtag, but back in the day, both municipalities were like outback towns that were still basically agrarian in nature and through which uneven gravelly roads ran. It was whispered, at least among kids such as I was, that there were “aswangs” (shape-shifting people who feasted on the internal organs of animals and other people) who lived among the population at least in Cuenca. This story was likely totally unfounded and, like the aswang itself, was among those told by parents to scare children into going to bed at night. Lian was another town in Batangas similarly branded unfairly as aswang-town. Ditto Capiz in Antique. In the present day, of course, it is doubtful that the stories have persisted. The most common explanation for the slanting of houses in the stretch of road past Cuenca heading into Alitagtag, therefore, was that for some unexplained reason the slanting warded off not only the aswangs but also other evil spirits. Typically, there were no plausible explanations as to how the slanting was supposed to have prevented the aswangs and other malevolent spirits from entering households, or why houses past this stretch of road either way returned back to normal orientation. 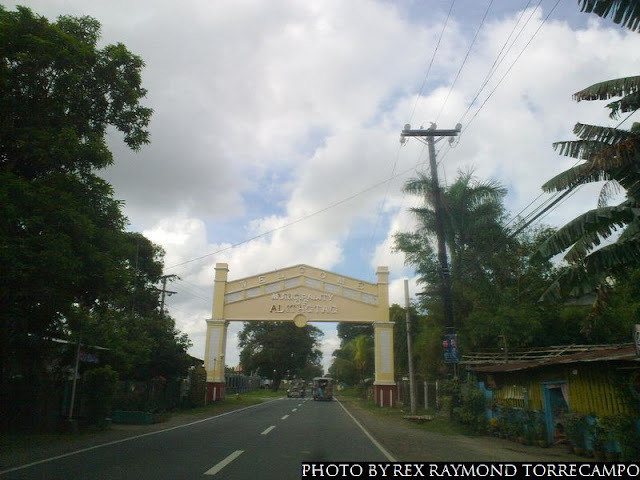 “The former national road was actually the one that would pass by Barangay Dalipit, Alitagtag, San Jose then Banay-banay. Seeing it as a long road to travel, the government tried to find a way on how travelers would reach Banay-banay from Alitagtag in a shorter period of time. It was May 18, 1987 when the blueprint of the Cadastral Map was approved by Leopoldo Ulanday, Regional Director of Region IV, with the citation of Coo.834 Case-14 CM 13 523 on 121 0130t Sec.2 and a scale of 1:200. This blueprint showed the new implemented diversion road connecting Barangay Pinagkurusan, Alitagtag and Cuenca then to Banay-banay without passing by Barangay Dalipit and San Jose anymore. The road is actually a road of Dominador East and West. Seeing it as a more accessible road, later on it was recognized as the new national road. Thus, it also became the national road since the former national road was too narrow to the extent that when a truck passed by, it would become a single-liner road. If I am being honest, I am having difficulty making something of this explanation. The “diversion road” that she refers to confuses me because that stretch of road leading from Cuenca to Alitagtag in the present day has been the same stretch of road that we used on our way to Nasugbu way back in the sixties. Other sources I have come across while researching the history of Batangas seem to show that the same road used to be the Highway 417 in American World War II maps. This is an explanation which I had not heard of before, and is certainly much more positive than the aswang scare stories of old. It is also a lot more believable because, to the present day, it is a preference among many families building their first houses to require that these be oriented, as far as the lot would allow it, to face the east. (Although, naturally, this is only possible on one side of the road.) There are, in the present day, established from studies apparent benefits to be had from orienting a house towards the east. Given the historical context of these slanted houses in Cuenca/Alitagtag, however, there has to be some heretofore unmentioned ancient belief about the benefits of orienting the house towards the east. Needless to say, this does not really explain why houses begin to face normally, i.e. facing the road, past the stretch of road in question. If anyone has a plausible explanation, do say in the comments section below. 1 “Alitagtag,” by Chef Anapot, online at Kusina ni ANApot. 2 “Filipino Building Beliefs,” by Architect Ernesto R. Zarate, online at the Philippine Commission for Culture and the Arts web site.